Posted: Sun Apr 14, 2013 5:40 pm Post subject: Deshret (Red Crown) Origin? Could someone possibly point me in the direction of information describing the origin of this crown? I can find thousands of sources indicating a vague association with Lower Egypt and describing its meaning but nothing that points to its actual invention. 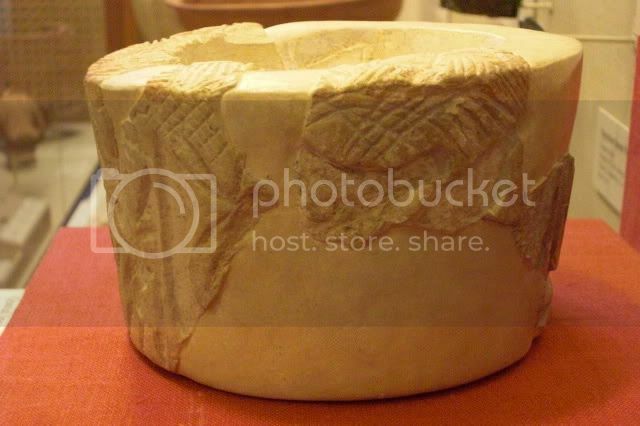 I am only looking for attestations of this crown pre-dating the Narmer Palette, if any exist. the palette is the earliest image of the king wearing the crown from what i have read. they don't know much about the origins of the crowns at all really. Posted: Mon Apr 15, 2013 9:12 am Post subject: Re: Deshret (Red Crown) Origin? ... origin of this crown? ... a vague association with Lower Egypt ... I am only looking for attestations of this crown pre-dating the Narmer Palette, if any exist. The oldest known representation of the red crown comes from Naqada (Nubt / [gr.] Ombo, main cult place for the god Seth in Upper Egypt) and was found by Petrie (Naqada and Ballas, 1895, Pl. LII, no. 75). The crown is shown in relief on a sherd from a large black-topped red ware vessel dating to Naqada I (around 3600 B.C.). If we accept the origin of the white crown in Hierakonpolis, than the view of the rulers there that the red crown represents a northern ruler (the one in Naqada) could be the origin for the later assignment of the red crown to the northern part of the country. Posted: Mon Apr 15, 2013 5:39 pm Post subject: Re: Deshret (Red Crown) Origin? Thank you very much for the info and thank god for the internet archive! Curiously, I must now ask about the White Crown. The oldest attestation I have found for it is on an incense burner from the Nubian A-Group culture between the 1st & 2nd cataract south of Hierakonpolis (Abu Simbel stretch of the Nile, roughtly). Is there an older attestation from Hierakonpolis proper or is the figure on the incense burner in dispute? Posted: Mon Apr 15, 2013 5:44 pm Post subject: Re: Deshret (Red Crown) Origin? wait a sec...forgot about the scorpion mace head. However, I guess the dating isn't too clear during this period. Posted: Mon Apr 15, 2013 9:55 pm Post subject: Re: Deshret (Red Crown) Origin? Baumgartel, E. J. 1975. 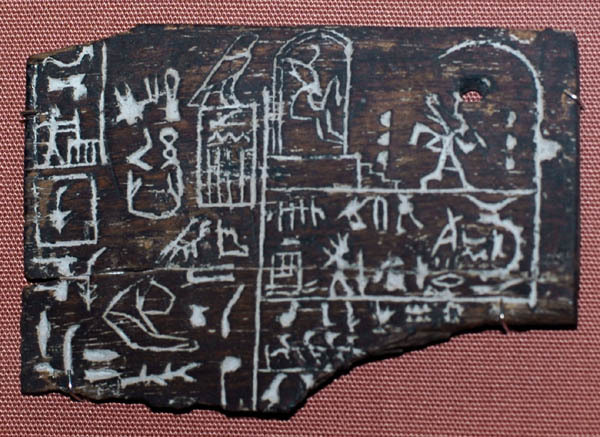 Some remarks on the origins and titles of the archaic Egyptian kings. JEA 61: 28-32. Wainwright, G. A. 1923. The red crown in early prehistoric times. JEA 9: 26-33. Posted: Tue Apr 16, 2013 9:21 am Post subject: Re: Deshret (Red Crown) Origin? ... I must now ask about the White Crown. The oldest attestation I have found for it is on an incense burner from the Nubian A-Group culture between the 1st & 2nd cataract south of Hierakonpolis (Abu Simbel stretch of the Nile, roughtly). Is there an older attestation from Hierakonpolis proper or is the figure on the incense burner in dispute? The second object with an early representation of the white crown comes from Upper Egypt. It is about the same age as the incense burner, a "Carved handle of a ceremonial knife" (New York, MMA 26.241.1). See for that also Williams / Logan / Murnane : The Metropolitan Museum Knife Handle and Aspects of Pharaonic Imagery before Narmer. - In: Journal of Near Eastern Studies 46 - 4. - 1987. - pp. 245 - 285. I am not convinced that a white crown is represented on the Qustul incense burner. There is not space for a seated figure below it unless the crown is vastly out of scale. I The tip and base of the 'white crown' skittle shape are missing. it could be a bird's body. That is my opinion on the thing. Said shape is found next to another representation of a bird, amid marshes. Below is the side of the burner that is supposed to feature the white crown. It is nowhere to be seen, and it shows how much imagination went into the reconstruction! There is not a red crown on the King Scorpion mace, and the idea that one may have featured on a missing part is speculation. This, of course, is up to you... But changes not that photo and re-drawing on the page from the Oriental Institute show, in my view, convincingly and clearly the opposite: The Qustul Incense Burner. ... There is not a red crown on the King Scorpion mace, and the idea that one may have featured on a missing part is speculation. Dreamregent mentioned the scorpion mace. (Which I saw in Oxford the other day, incidentally). I have seen speculative reconstructions showing a fugure in the red crown, but it is not based on any part of the mace that survives. The shape on the Qutsul burner is surely not a white crown. Who would draw a crown larger than the figure wearing it? That's what the speculative reconstruction would have us believe was depicted. That's just crazy! The entirety of the seated figure in the 'reconstruction' is based on no evidence whatsoever. The surviving shape, comprised of two grooves, is not like the hedjet white crown, either, because the straighter line is on top and the curvier one is below, whereas with the white crown the reverse was the case. It looks more like a goose's body than a white crown, and the marshy setting and the fact that another bird is adjacent makes that more likely. 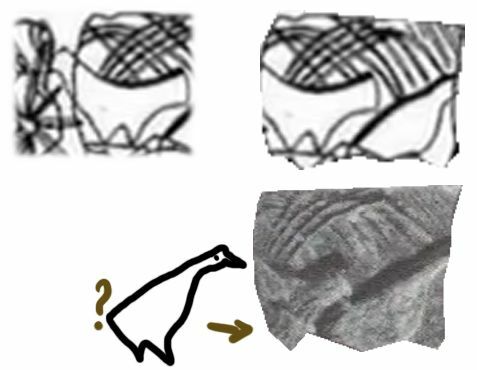 A close examoination of the fragment in question also reveals a square edge that would not be present on the brow of a white crown. This is the goose's backside! A bird would make no sense in the context of a marsh scene next to another bird? I fail to see how you arrive at that conclusion. There is no context for the seated king figure. There is a whole load of nothingess below the two lines (that could quite easily be a goose's body), as can be seen from the coloured photo. There isn't space for a figure to scale with the supposed crown, as noted, were any crown actually in sight. There isn't room for a seated king, there is barely room for a disembodied head at the proper scale. Because it is not just a "marsh scene". It is a boat procession, leading to a building / temple / ritual place / palace (?). And it is not just a bird, it is a falcon on the palace facade, a symbol for the king known since predynastic time. In the boat with king and falcon on palace facade there is also the "Rosette", also known from the Narmer Palette (in connection with the king with the white crown, not on the other side where he wears the red). It is there a symbol for the "Servant of Horus", the so called sandal carrier (a king priest or maybe the "proto-vizier"), in close connection to the king. By the way, it is not only the red or the white crown. On this label (London, British Museum, EA 32650) we see the oldest known representation of the double crown: King Den during a heb sed, running & seated on a throne.